Brokeback Mountain is the heavy favorite to dominate Sunday's Academy Awards ceremony. With nominations for best actor, best supporting actor, best cinematography, best musical score, best director, best adopted screenplay writing and, the big one, best picture, Brokeback Mountain is well-positioned to walk off with Oscars in most of the major categories. I haven't seen Brokeback Mountain. In all probability I never will. The best way to explain why is to simply say that the plot doesn't appeal to me. Normally I would be predisposed to seeing Brokeback Mountain since its two central characters are cowboys. And cowboy movies are, even after all these years, my favorite. But Brokeback Mountain also centers on the emotional and sexual bond that develops between the ranch-hand and the rodeo cowboy. And I confess that I'm unlikely to buy a ticket to see a movie about a love story between two men. Having admitted that, let me quickly add a series of comments in self defense lest my position be misinterpreted. First, I haven't purchased a ticket to see any movie shown in a theater in over a year. I have not seen a single one of the Oscar-nominated movies. Second, in much the same way that I will never see Brokeback Mountain, I have also never seen any Arnold Schwarzenegger movies. The reason is the same: the plots don't appeal to me. Third, I didn't see Bridges of Madison County, a heterosexual love story. Clint Eastwood and Meryl Streep are two of my favorite actors. But the schmaltzy romance held no attraction for me. Fourth, I am not avoiding the film for homophobic reasons. I support, but do not crusade for, gay rights. And I enjoyed Philadelphia and Tom Hanks' Oscar-winning performance in the lead role. So, in conclusion, I won't be watching Brokeback Mountain…even when it is released on DVD. What it comes down to is that Brokeback Mountain bastardizes the great genre that is the Western movie. 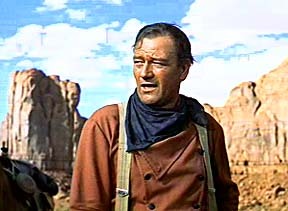 When I think about Westerns, I think about John Wayne. And coincidentally to this year's 78th Annual Oscars is the fact that Wayne's greatest Western, The Searchers, is celebrating its 50th anniversary. Wayne, in his role as Ethan Edwards, often said that Edwards was his favorite character. The movie and Wayne's performance in it were ignored during the 1956 Academy Awards; the winners were Marty and Ernest Borgnine. But despite the snub five decades ago, The Searchers reputation grows greater every year. Two of America's most renown directors, Martin Scorsese and Steven Spielberg, say that the John Ford classic inspired them as much as any film they ever saw. Hollywood insiders say that before Spielberg begins a new movie, he watches A Guy Named Joe, It's a Wonderful Life, and The Searchers. The interesting question is why does The Searchers endure while other films—Western or not—fade away? The answer is John Wayne. That's not as simple a response as you might think. Wayne, as most movie buffs know, had shortcomings that would have derailed the careers of lesser actors. Despite Wayne's portrayal of courageous figures, he avoided service in World War II. And the hype surrounding his short-lived stint as a University of Southern California football star was mere Hollywood fluff. Still, Wayne's stature, like The Searchers, lives on. We, his fans, make that possible by linking Wayne to some of our most treasured, and romanticized, national legends about ourselves: brave, independent, stalwart, and independent. I have a personal reason for admiring Wayne. Over the years I have collected some mementos from Wayne's movies. One of my favorites is an original signed note from Natalie Wood to Wayne on a photo from one of the final scenes of The Searchers. On the 8x10 black and white Wayne, then about 50, is carrying the 18-year-old Wood in his arms while the two are on horseback. He is taking Debbie Edwards (Wood) home after the Comanche held her captive for many years. "You have been so great to me. Love, Natalie"
Most who knew and worked with Wayne would say the way he treated Wood was typical of him. Even though Wayne was the biggest of the superstars, he never put on airs around his co-stars, family, fans and friends. And that's the way I think about John Wayne.